Put it in a pretty pink bucket! 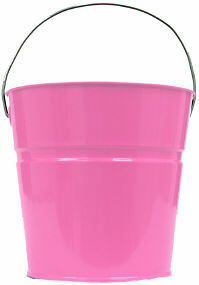 These pink pails are great to use for crafts, gift baskets, or decorative arrangements. Fill them with candies, dried or plastic flowers or gifts for a shower, house warming party, table decoration or as a door prize. Great for kid's crafts or projects! Please note: This pail is not watertight. Click to see our full selection of pink buckets for baby showers, parties, and birthday celebrations!